For many fishermen, visions of a 30-inch walleye or a 50-inch musky are what drive them to get out there and fish. I love catching a big fish just as much as the next guy, but for me the real trophy is what ends up on the plate. A huge walleye would look great hanging above the fireplace, but more than likely it wouldn’t be that great to eat. Here in Minnesota the walleye is king, everybody loves catching them and most everybody loves eating them. I am the exception to that rule. I would rather catch a stringer full of perch or sunfish. There are several reasons for this. First and foremost, they are usually easier to catch. 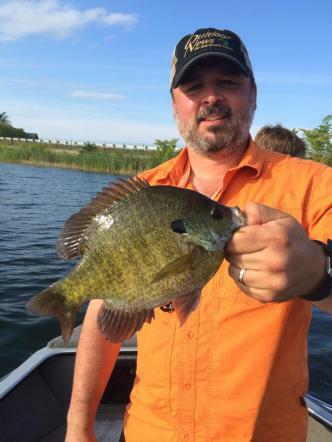 Small pan fish like perch, sunfish, bluegills and rock bass are usually the first fish we catch when we are little. When you get into a school of pan fish, the action is usually nonstop and you can catch them one after another and end up with a limit of good eaters in no time at all. When I was a kid, pan fish are all I would catch fishing off the dock at my grandparents' place. It doesn’t take any fancy fishing gear to catch them either. I used to catch stringers full of pan fish with nothing more than a hook and a 2-foot Snoopy pole. My fishing pole has changed, but I still just use a hook, a 1/8 ounce split shot weight, and a small chunk of night crawler. 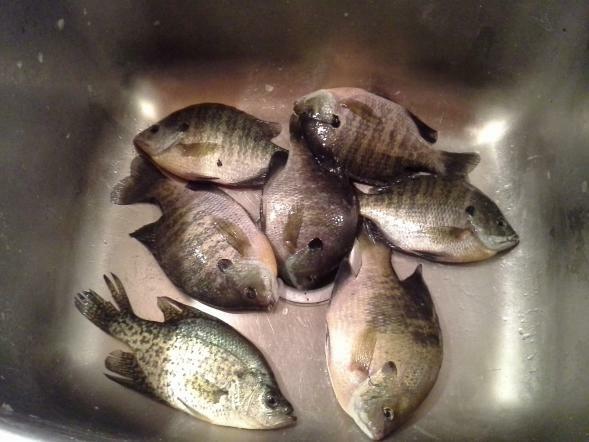 The second reason is that I love to eat them; perch especially are one of my favorite fish to eat. When I was a kid and would catch a stringer full of perch, my grandmother would fillet them and fry them in a saltine cracker breading. It is still my favorite way of eating them, but a couple of years ago I started using the pan fish I caught to make fish balls and that led to pan fish chowder and curried fish and many other recipes including the spring rolls below. I was surprised at how adaptable they were. I was out for lunch one day at a Vietnamese restaurant by my house and ordered some shrimp spring rolls. The spring rolls were light, crisp, and wonderful. While I was sitting there eating them I was thinking that I could probably make something similar with pan fish the next time I got some. When I finished my lunch that day I asked to talk to the owner who was nice enough to tell me all about his process for making the spring rolls. My process for making these spring rolls is very similar to what he told me but I had to make up the seasoning portion. Mine are a mixture of fish and water chestnuts along with some shredded carrots. I also added some garlic and onion powder as well as some ginger and made a paste that I spooned into the rice paper wrappers. I had never fried rice paper before and was afraid they would cook too quickly and possibly burn before the fish would cook but the wrappers held up really well and had a very wonderful crispy chewy texture almost identical to the ones I had. 1. Stir together the cornstarch and the rice vinegar until well combined, then put all the ingredients except the grated carrots into a food processor, mince the ingredients together then add the cornstarch mixture and pulse a few times to incorporate. 2. Mix in the grated carrots and combine until evenly distributed. 3. Lay out a damp dish towel flat on the counter, and one at a time, dip each rice paper wrapper in water for a few seconds and then lay it out on the damp towel. 4. Place a quarter cup of the mixture in the center of the rice paper and then wrap into spring rolls. 5. Heat your oil to 350 degrees and fry in batches for 5-6 minutes. 6. 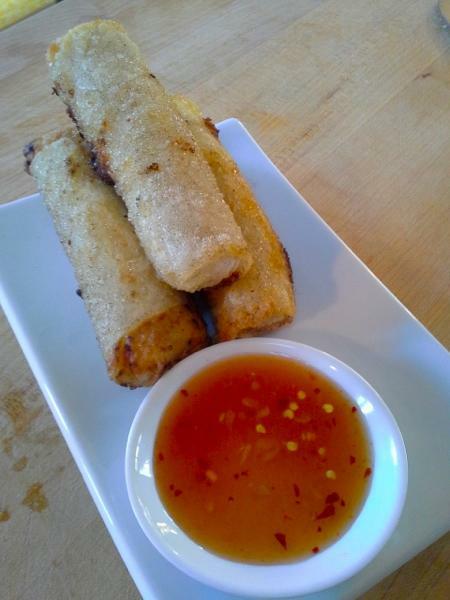 Serve the spring rolls with a Thai fish sauce, hoisin, oyster sauce, or any sauce you would like.